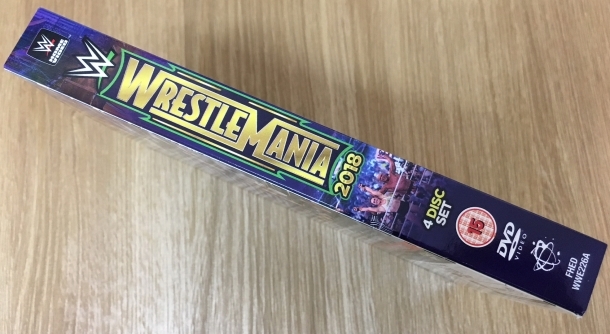 As it is on Pay-Per-View (or the WWE Network in this era), WrestleMania is one of the year’s big highlights when it comes to wrestling DVDs. 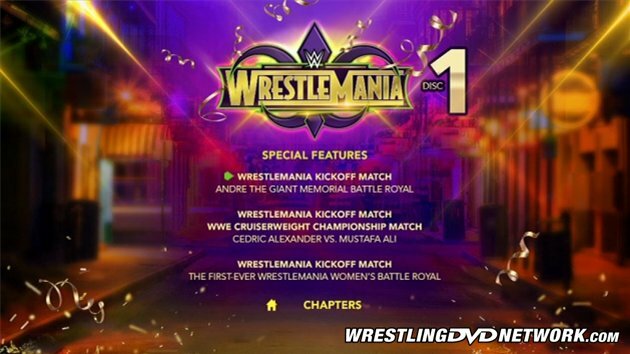 This year’s edition provides another enticing set, providing the ‘Mania event, the post-‘Mania episode of RAW, and when bought on WWEDVD.co.uk, NXT TakeOver: New Orleans on a fourth disc! The DVD also includes the three Kickoff Show matches, which wasn’t the case for the U.S. release of last year’s WrestleMania (this actually contributed to Austin Aries’ issues with WWE that allegedly led to his release). Two things stand out before we press ‘play’ on the main feature: the Hall of Fame ceremony has been omitted, presumably because it lasted too long to squeeze onto this set (that many of the wrestlers were unable to stick around for star inductee Goldberg’s speech on the night says it all), and in the United States, the DVD is rated TV-14. This is probably due to Brock Lesnar smashing Roman Reigns’ head open in the main event (more on that later), but it’s still a surprise for the PG product to have this rating, especially for the year’s biggest event (I believe Extreme Rules 2012 is the only modern PPV to also be rated TV-14. I’m convinced that Great American Bash 2008 was also a PG event that ended up becoming TV-14 due to the bloodshed on that particular show, since the previous Night of Champions card and previous editions of RAW had been rated PG; perhaps some of our visitors will know for sure?). I should also mention that NXT TakeOver also has a TV-14 rating, though the RAW episode featured here doesn’t appear to have a rating. Very strange. Anyway, with the housekeeping out of the way, let’s get to the DVD, beginning with the big one, WrestleMania 34! This is a great way to kick things off. It’s a slow-burning contest which has some electrifying near-falls, as well as some memorable entrances in front of a hot crowd. It provides further evidence as to why Seth is, as things stand, the front-runner for WWE’s Wrestler of the Year so far. The top-notch action continues in this contest, which is as good as anything on the entire show. What I wasn’t a fan of, though, was Asuka’s undefeated streak ending here. It seems to have been done purely for the benefit of Carmella (who would cash in her Money in the Bank briefcase on Charlotte two days later), and those who claim that the decision would benefit Asuka in the long-run have to be disappointed by how she’s been booked since ‘Mania. Meh. This is watchable, but entirely unmemorable. Had Randy Orton not been involved, I doubt this would have been on the main card, and if PPVs nowadays weren’t five hours long, this bout probably would have been omitted altogether. Everyone makes the effort, but we get matches like this on free television every week. Now we come to what is probably the most well-received match of the entire night. 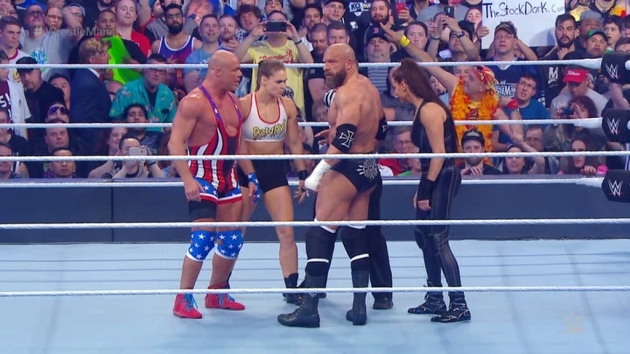 Kurt Angle finally returning to WrestleMania was underplayed but is a cool moment, nonetheless. The standout performer, though, is undoubtedly Ronda Rousey, who demonstrates that she is more than qualified for her new career, and combined with entertaining moments from both Triple H and Stephanie, the match is a real treat. This is likely what we will most remember WM34 for, at least when it comes to the positives. As with the United States Championship match, this exists purely to fill time. That’s a shame, because The New Day and The Usos put on terrific efforts throughout 2017, and even Harper and Rowan have previously had belters with Jimmy and Jey during their Wyatt days. The presentation definitely puts over The Bludgeon Brothers, but this one is definitely fast-forward material. Unlike some, I enjoyed the storyline where John Cena felt desperate enough for a WrestleMania moment that he would try to call out, and indeed insult, The Undertaker, and I was willing to pretend that Cena legitimately could have missed ‘Mania as part of the plot. Ultimately, after an Elias cameo, the Deadman rises, and we get a squash-like win for ‘Taker. I hope we get a full-fledged rematch at ‘Mania 35, but even if we don’t, this segment was very well-received on the night and is a success overall. At this stage, it’s pointless to have the debate as to when Undertaker will ever truly retire. 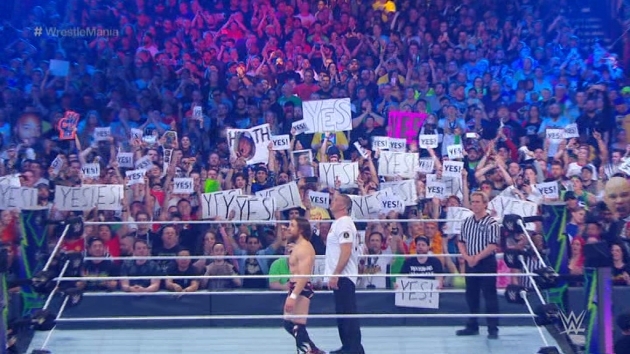 To me, WrestleMania 34 went from an exciting card on paper to can’t-miss when Daniel Bryan’s in-ring return was announced. And this match does all that is required: re-introduced Bryan to the ring in a manner that we get his greatest hits, so to speak, whilst also playing off his previous injury problems (and, of course, wrapping up the long-running Owens/Zayn vs. Shane storyline). It’s not a great match by any means, but given Bryan’s well-documented struggles to return to active competition, it’s hard not to smile when watching this, especially the closing moments and the post-match scenes. Not everybody was a fan of the way that this match was set up (Alexa and Mickie James bullying Nia Jax; Mickie being cast in this role was odd considering that she herself was the victim of a bullying storyline a few years ago), and some also felt this should have been a pure squash. But the match isn’t bad at all (Alexa’s Twisted Bliss off the top rope to Nia at ringside is an underrated moment from the show), and Jax’s title win gets a nice pop. It’s just bizarre that, as of this writing, WWE appears to already be turning Nia heel again. Upon first viewing, this was the biggest disappointment of the night, as the much-ballyhooed “dream match”, the first battle between Styles and Nakamura in a WWE setting, failed to match expectations. Upon second viewing, though, it’s a lot better than I had remembered; perhaps because we were four hours in at this point, and due to the fact that both men were babyfaces without a real issue to speak of, the crowd is quiet for much of the bout, which always makes a match seem worse than it really is. Based on the action alone, it’s a damn good effort, though it still doesn’t quite reach classic status. 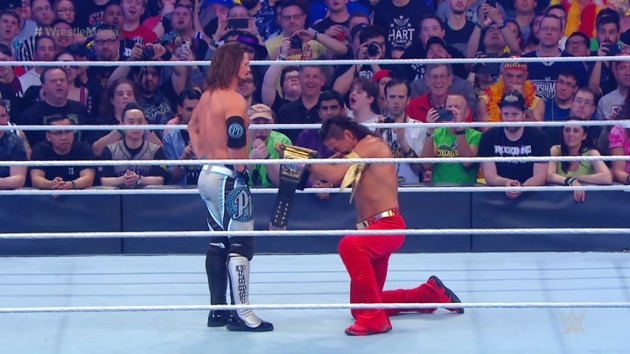 Nakamura’s post-match heel turn is a welcome surprise, and their feud is still ongoing as I write this, with a Last Man Standing blow-off scheduled for Money in the Bank. Because I was anticipating a returning legend or a surprise debut, Braun Strowman picking out a ten-year-old fan to be his mystery partner was a bit of a let-down. Those suggesting that it was a huge sign of disrespect to the RAW tag team division, though, overanalysed the situation: Strowman handled all of the action, only tagging Nicholas in for a brief moment which didn’t lead to any physicality with Cesaro (and WHAT a reaction when Nicholas does become the legal, erm, man), and it simply plays off as a WTF ‘Mania moment more than anything to be taken truly seriously. 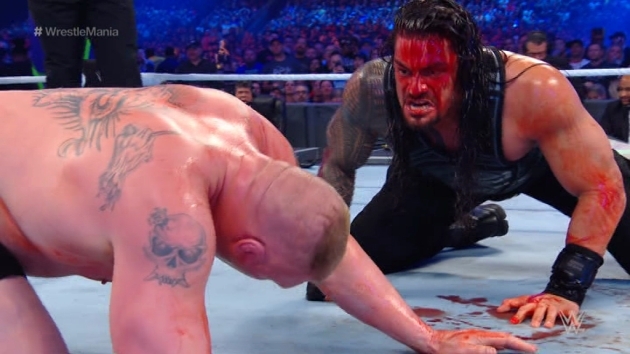 Looking back, Lesnar busting Roman WIDE open towards the finish was pointless since he was bleeding for no more than 90 seconds, it jeopardized the show’s TV-PG rating as mentioned earlier, and a similar incident at SummerSlam 2016 left Randy Orton genuinely concussed. Plus, it didn’t affect the outcome: after a sudden comeback by Reigns (which the crowd DO react to, though not entirely positively of course), Lesnar drills Roman with the SIXTH F5 for the shock pinfall win. It’s funny because the whole “LOL Roman Wins” feeling surrounding this match stemmed not from WWE, nor its story-telling, but from the rumor spread over one year earlier that Lesnar vs. Reigns 2 was the plan for this show. While plans may indeed have changed, is it possible that WWE played this, and the speculation over Brock’s future, to the hilt in order to deliver a surprise result in the main event? Whatever the case, Lesnar retaining was a result that few expected, and he’s still holding the Universal crown as we speak! Will he finally drop the title at SummerSlam, or will he retain it through to WrestleMania 35? Will Reigns indeed be the man to dethrone Brock, or is Roman a pawn in a story that will see somebody else coronated as the new face of RAW? Plenty of questions came out of this match and the result in particular. Looking at this match in a vacuum, though it wasn’t as good as their previous bout at WM31, the first half is watchable, with the second half and the disinterested crowd being what drags this match down a few pegs. One final observation: whilst Roman obviously had more detractors than supporters in New Orleans, fans do react more loudly when Roman makes his comeback than for much of Lesnar’s offence, even if Lesnar gets a huge cheer upon his unexpected victory. Two things stand out from this match. The first is the result, and in particular Bray Wyatt returning from the Lake Of Reincarnation to help Matt Hardy triumph in the Humongous Wonder Number 8 Battle Royal. The second is Goldust dabbing after eliminating R-Truth. That should demonstrate how interesting this match is, though it’s fine as filler material. Because the 205 Live crew no longer appear on RAW, this match felt a little out of place. However, both competitors prove that they belong on the grand stage with strong performances and some killer spots. The finish seemed to be setting up a Cedric heel turn, but that didn’t end up being the case. The upshot is that we get a very good match, though one that was a shade inferior to Neville vs. Austin Aries in Orlando last year. This is more noteworthy than the men’s Battle Royal, because this is the first time that the females are battling in such an environment at WrestleMania. At least, if you believe WWE (cough WrestleMania 25 cough), and we haven’t mentioned how The Fabulous Moolah’s name was removed from the match after a major online backlash, nor the potentially questionable redesign of the trophy. Naomi claims the prize, but WWE has barely used her in a meaningful role for years, making her victory less meaningful. I’ll cover the matches briefly here, since the RAW after ‘Mania is more about the angles than the in-ring action. On the subject of segments, we see Ronda Rousey once again destroy Stephanie McMahon’s arm, Braun Strowman and Nicholas officially vacating the RAW Tag Team Championships on account of Nicholas still being in school and thus unable to defend the titles (Kurt Angle would set up a Tag Team Eliminator, where the winners of Gallows/Anderson vs. Revival and Hardy/Wyatt vs. Titus Worldwide would meet, and the victors of THAT match would face The Bar at Greatest Royal Rumble for the belts); a promo where The Miz informed Seth Rollins that his entire family cried because he had lost the IC gold to Rollins the previous night, and with the segment resulting in Jeff Hardy returning from injury; an also-returning Bobby Lashley interrupting an Elias concert; and Samoa Joe ALSO returning (there’s a theme here) to confront Roman Reigns and inform him of his plans to destroy him at Backlash. Oh, and we get a funny moment backstage as Matt Hardy and Bray Wyatt greet Brother Nero himself, with Jeff’s interactions getting strange looks from Rollins and Finn Bálor. Further adding to that point, No Way Jose made his debut here. The match is very short, as Jose easily dispatches of John Skyler. Jose’s character is a lot of fun, but I expect him to reach the same level that Adam Rose previously did (in other words, not a very high level on the card). In 2016, the arrival of Gallows and Anderson on RAW created a buzz, as did Dash and Dawson debuting on RAW one year later. In 2018, this has sadly become just another match, and this proved to be the case for this bout, a well-worked contest which failed to hold much crowd interest due to WWE’s booking team not giving people reason to HAVE any interest in either The Club or The Revival. Upon first glance, this (very respectable) clash between Sasha and Mandy was designed to further the dissension between Banks and Bayley, who makes an appearance at ringside. In reality, though, it sets up the post-match speech where Paige announces her retirement in a very emotional moment. It’s hard not to sympathize with Paige, whose in-ring career has been cut short at such a young age. In a positive development, Paige would be named the new SmackDown General Manager the following night. The Authors of Pain joined Ember Moon in making their RAW bow here, easily defeating Heath Slater and Rhyno (Slater had used the exact same line that The New Day used last year when they faced The Revival, making an open challenge to any combo, which virtually guaranteed an NXT call-up). 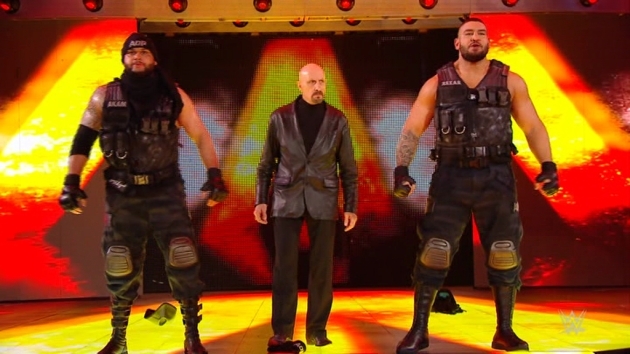 Akam and Rezar dumped their master Paul Ellering afterwards; in hindsight, this was poor judgement since the AOP have barely featured on RAW in recent weeks. 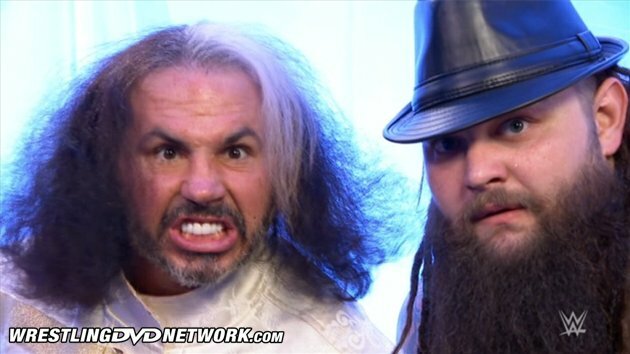 Matt Hardy and Bray Wyatt officially debuted as a team here as they make easy work of Titus Worldwide. At this point, it’s easy to forget how surreal it is that Matt Hardy is using his Broken/Woken gimmick on WWE television. Matt and Wyatt certainly had the fans in the palms of their hands here, and they would go on to win the RAW Tag Team Championships, which they are still holding at present. After a backstage discussion with Kurt Angle concerning their futures, Angle noted his roster was full with regards to tag teams, but “I hear TNA are hiring” (what a line that was). Kurt eventually gave Sami and Kevin a chance to battle each other for a lone roster spot, and this is a really good encounter which fans are well into. The no-contest finish seemed to extend what could have been a fun storyline… until Stephanie McMahon simply hired both to RAW one week later. For such a major television event in WWE’s calendar, this six-man tag closing the show is a bit of a let-down. Judged for what it is, though, it’s a fun match, albeit one which wouldn’t look out of place on a house show. It allows the spotlight to shine on a returning Jeff Hardy, and the babyface triumph means that it’s a feel-good end to a memorable edition of RAW. If you have a half-hour to spare, watch this match. It is a fantastic collection of high spots which sees all six men shine at various points, though Ricochet’s stunning performance is the lasting memory. Adam Cole comes out on top (literally) in the best Ladder match held in a WWE setting for a long time. Watch it now! After the huge reactions awarded to the opener, fans are quiet for this contest, a rematch from TakeOver: Philadelphia. The action is fine, though, and the storytelling is very good, not to mention Shayna’s superb reversal of the Eclipse into her Kirifuda Clutch which seals the title win. More than anything, this contest proves that it’s almost impossible to have a bad match on a TakeOver special, because this occasionally feels like too much is going on, and yet it’s still very entertaining. Plus, we get an unexpected Roderick Strong heel turn at the climax, which elevates this match to another level in terms of importance. This is excellent. Almas’ clash with Johnny Gargano in Philadelphia will be remembered more fondly, but don’t assume that this is just okay by NXT standards, because it’s a tremendous title match that was as good as anything at WrestleMania the following day. Black’s title victory was a surprise, too, and it gets a great reaction from the New Orleans crowd. When fans draw up their Match of the Year candidates for 2018, this unbelievable brawl has to be on that list. The deeply personal rivalry, the fact that fans are totally drawn into the storyline (chants of “f–k you Ciampa!” greet his entrance), the compelling action, the heart-stopping near-falls, the superb story-telling and throwbacks to past Ciampa/Gargano moments, and the red-hot finish all make for a truly outstanding match. Again, you have to watch this bout. Starting with WrestleMania, there is definitely more to like than to dislike, and with several high-quality matches and unpredictable moments, it ends up being superior to both WM32 and 33. The big problem is that neither of the top two title matches are able to meet expectations; had they done so, this would have been a Top 5 ‘Mania. Instead, AJ vs. Shinsuke is very good but not quite great, and Lesnar vs. Reigns comes across badly due to the live audience and the questionable layout of the match, not to mention the finish cutting off any momentum that Roman had. The Kickoff Show bouts are worth watching, but not must-see. In the end, then, WrestleMania 34 is a good effort, and at times is very exciting, but it falls short of being one of the very best Show of Shows. RAW from the night after ‘Mania is very entertaining, with plenty of debuts and returns, along with other moments that range from tear-inducing (Paige retiring) to hilarious (Angle name-dropping TNA). The one thing that it misses is that truly major moment; Lashley resurfacing is big news, but otherwise there is nothing that can compare with, say, Brock Lesnar coming back or the announcement of Rock vs. Cena for WM28. NXT TakeOver: New Orleans, meanwhile, is sensational. It may be the best TakeOver yet, and if you’ve never seen an NXT show, this is the perfect introduction to the brand. Purely from an in-ring standpoint, TakeOver blows WrestleMania away! As an overall set, it’s clear that this has something for everyone, and each show has its moments. There have definitely been better WrestleManias, and some ‘Mania weekends have featured all-time great moments that far surpass anything featured here. But as an overall package, this is one hell of a set, covering the entire range on the quality scale and eliciting every emotion imaginable. So, I would highly suggest going out of your way to get this DVD, in particular the four-set edition featuring TakeOver: New Orleans. – UK/Europe: This Monday! Pre-order WrestleMania on DVD or Blu-ray now on Amazon.co.uk. – USA: RIGHT NOW! Grab WrestleMania on DVD or Blu-ray right now here on Amazon.com. I got my blu Ray with the nxt bonus disc. Well worth the money. The ladder match is friggin insane! I wish USA would get bonuses like the UK does. I’m so glad I got a region 2 player. You guys may want to mention how takeover being included was a UK exclusive. The first paragraph of the article mentions it. Not to mention several articles over the past month or so as well. Lol, adam – you may want to read the actual article before commenting. Div. For me, this release is not cool because of Wrestlemania itself, but because of the extras. I loved the Takeover show, very cool that Fremantle gives us that bonus disc. The Raw after Mania was also a fun show. Surprised Snickers sponsor was still left intact – usually all sponsors info are removed from replays/home video releases. This Tuesday. My copy was send yesterday via Amazon.ca so I will receive it Monday probably. Less than 0% chance of that happening. They just signed the biggest TV rights deal in history with Fox. Worth $1 billion over 5 years. No way do they get that deal if they were still TV-14 and doing the kind of things they were doing during the attitude era. Did your copy say ‘4 Disc Set’ on the front, Mark? Mine arrived and still says ‘3 Disc Set’ on the front, although the NXT disc was included inside. Just a minor note on that; I believe Austin Aries has stated in interviews that the DVD issue wasn’t a factor in his release at all, but who knows? Thanks for the review! I just wish Angle hadn’t have come across so slow in the ring in his match; when he’s not even as good as Stephanie, you just know it’s time to hang the boots up up. 🙁 Shame. Same with the Blu-ray Rabid. Says 2 disc set on the front. Just out of interest, in the DVD was the NXT disc packed in a plastic sleeve or was it loose inside the paper insert slot in the case? Plastic sleeve for me, thankfully. Was the summerslam where Brock lesnar busted open Randy Orton or the ppv where Cesaro busted his teeth and blood poured everywhere TV-14 ratings? Well that doesn’t make since? The Cesaro spot was an accident. When it comes to Lesnar, I don’t think it was planned. Lesnar just did that. 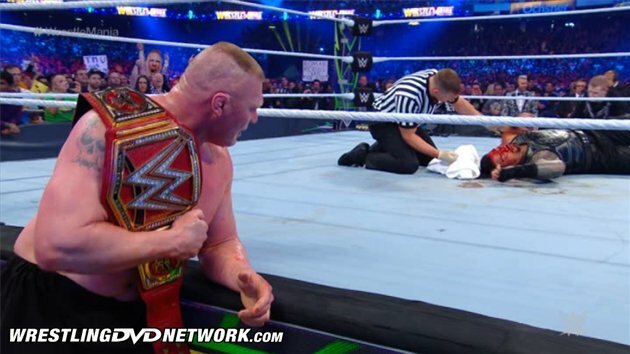 I have a feeling no one in WWE had the guts to tell Lesnar, that if he did that again, he’d be fired. If some random midcarder did that in a match, I bet he would be in big trouble. Brock didn’t go into business for himself. He’s not that dumb. It was reported in the Observer that Vince and Reigns both knew full well what was gonna happen with the hard elbow shots. Same with Brock and Orton at SummerSlam. Both Vince and Orton knew exactly what was happening. Ok, thanks. I didn’t know that. It just seems odd that WWE would allow that since the product is PG 13. It’s really ridiculous if you think about it. They won’t allow blading anymore because some people think it’s “barbaric”, yet they’ll allow someone to get legit busted open with hard shots to the head. So what sounds more barbaric, cutting yourself nice and easy with a small blade, or getting your skull pounded in and most likely receiving concussions because of it? I don’t understand their logic. I just think it’s WWE being afraid of Lesnar leaving. So they are afraid to put their foot down, and he get to do what he wants. He gets to do what he wants because they allow it. As far as his schedule goes, people complain that WWE should be mad at Brock for only working so many days a year. First off, WWE are the ones that negotiated the number of days per year in his contract to begin with. If they didn’t like him working a part time schedule, they would’ve never agreed to it in the first place. About him legit busting people open, again, that’s all planned ahead of time. It’s not Brock saying “Hey, I’m gonna really elbow the crap out of this guy tonight, just to let you know.” It’s all laid out for him and he does what he’s told. As for why WWE would do hardway blood while being a PG company, they can use the excuse that it was an “accident”. Which is why they no longer blade. But like I mentioned above, blading is much safer than getting legit pounded on and busted open. LP1 is spot-on here. Hypocrisy. Spot on. I’m not sure what went wrong (and continues to go wrong) with AJ/Nakamura, but this program has been a huge letdown. Their matches have been missing something and hardly come close to touching their great work in New Japan. As far as Lesnar/Roman, I had mixed views as this match felt recycled from WM31. I can’t get behind Lesnar’s one move/showing up whenever he feels like it situation, and I’m unsure if Roman is really the guy to dethrone Lesnar. I’d even go as far to say that the women’s title matches were superior to the men’s. Either way, the NXT show was about as perfect as you can get with an event. The main problem with the AJ/Shinsuke matches was the WWE hype machine building them up to the point where it was impossible for them to meet expectations. That happens more often than not when they promote a “dream match” and they’ve been doing it for years. HBK/Perfect from SummerSlam 93 being an older example of course. to me, that’s not even a debate. to me, Flair vs. Asukua was the best match of the night (although I can understand why many people prefer the mixed tag match, which to me was the second best thing on the card). I received my copy in the mail earlier this week and I’ve just finished the set. I’d say the UK release is definitely the best Mania home video since WM22 due to the sheer amount of footage included. I’ve always enjoyed the HOF but the post Mania Raw is a worthy replacement. It’s a huge shame that Takeover wasn’t included in the US release. I’d love to see the Takeover specials included as standard in all markets to add some much needed match quality and provide more value to us all as DVD/BD collectors.